We are a micro set up in 2012 with the aim of producing classic session beers all below 5% with the focus on championing English hops. We are never going to be pushing the boundaries in terms of brewing but have gained a good reputation for producing easy drinking session beers which people seem to enjoy. We did our first brew in September 2012 so we are still young in terms of our brewing. I used to full mash in my garage and due to redundancy I decided to ramp it up to full scale and see what happened. After completing a 3 day course just to solidify the idea I went in to it full on and hey presto less than a year later we were up and running. I suppose it’s a bit of a cliché but when someone says they had a good session on your beer and loved it is a great feeling. The smell of mash in the morning is not a bad way to start the day either. Is there anything you don’t enjoy about it? Cask cleaning ruins my day if I am honest as it’s a real necessity but just takes up a lot of time. To be honest no one really. No one I knew home brewed or brewed professionally it was just a passion of both myself and girlfriend (now wife) at the time. We decided to give home brewing a go and we just loved doing it . After many years of discussing the possibility of the brewery we jumped in with both feet. We are based in North Reddish, Stockport and have a 6BBL brewery, 2 fermenters so can brew twice a week. I don’t think so as all brewers at heart want to create the best product that they can and we all tend to follow similar patterns. I think in current terms we may be perceived as a little old fashioned due to us not dry hopping or using new world hops so maybe we are a little different in that way. We tend to brew what I like drinking. When designing a new beer I just go back to the home brew kit and use that to create 5 gallon then test it out on my neighbours and family to gauge their reaction. If it is all positive we jump straight to a full brew. Our beers are simple and easy drinking so I think we’re a safe bet when people are choosing our beers. We keep the name simple so you clearly know what you are ordering so maybe that works. We tend to brew the beers we like to drink unless we are asked by a pub for a specific beer then we can change things up. When I get the chance yes I do but it’s a rarity that I get the chance to do so. To be honest I tend to see what else is on the bar to try something new. This is a very common question which I always find difficult to answer because it really does change with the weather. 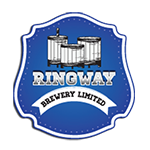 All the beers that we brew are beers we like to drink but if I really had to choose it would probably be Ringway Best Bitter. Luckily so far we haven’t had any real disappointments so far but it’s bound to happen at some point. We haven’t done any collaborations with any other brewers yet. Being originally from the North East I am a massive fan of Mordue, Wylam and Jarrow Breweries. All 3 are close to my heart being from the North East and they do a great range of beers to suit all moods I may be in at the time and have yet to disappoint me with any beers they have brought out. Jarrow Rivet Catcher and Durham Brewery Magus because I am a session ale drinker and these 2 beers are ones I can genuinely drink until I fall off my bar stool. A fairly recent one which I thought was magnificent was Little valley Stoodley Stout. Just a great easy drinking stout. We are looking to keg by next summer and get all our beers in to bottles by the end of the year. It is going great guns at the moment and some of the beers being produced are amazing and I love the variety we have on the bar now. That’s difficult to say to be honest. At the moment it is flying but some things can’t carry on as they are but we will keep trying to hold on to our bit of the market and ride the wave of beer. None to be honest we just tick along minding our own business. Cask vs. Keg – what’s your view? We are genuinely not bothered how beer is dispensed whether it be from cask, keg or bucket as long as it’s good beer that’s all we care about. CAMRA do a great job of promoting beer and have been very good to us since we started up. We are members of SIBA and the DDS has opened up new outlets that we otherwise wouldn’t have been able to go to. Keep brewing and enjoy it for what it is; a great hobby. If you really want to start a brewery for real then do your homework as it is very hard work but can be incredibly rewarding. We have been recommended by our local MP to provide beer at Strangers Bar in the house of commons so in November we are sending down 5 casks of Ringway Session for them.